Like Logic Studio, DP is now more guitarist-friendly. PRESS RELEASE: Digital Performer 7 is now shipping with many feature additions and productivity enhancements, including a new suite of modeled guitar effects plug-ins that deliver world-class guitar tones. DP7's suite of stunningly accurate classic guitar pedal emulations are modeled after all-time favorites from Boss®, MXR®, Electro-Harmonix®, Ibanez® and others. These stomp box plug-ins produce authentic tones made famous by the signature guitar sounds of artists such as Eric Clapton, Joe Walsh, Carlos Santana, Pink Floyd, Nirvana, and many other rock/pop legends. When users dial in settings for their favorite guitar tones, the resulting sound is identical to — and indistinguishable from — the real thing. The suite includes nine pedals, including the Tube Wailer™, Über Tube™, Diamond Drive™, RXT™, Delta Fuzz™, Wah Pedal™ and others. Users can experiment with hundreds of tones and thousands of combinations. Custom '59™ meticulously models three all-time classic guitar amplifiers: the Fender® Bassman®, the Marshall® JTM45® and the Marshall JCM800®. Users can adjust tone settings, drive and tube combinations to produce rich, luscious guitar tones that faithfully reproduce the sound of each amp. But Custom '59 goes further: users can mix and match the preamp tube, preamp circuit and tone stack from each model to create their own custom amps. The possibilities for tone are virtually limitless, all born from the iconic pedigree of three legendary originals. DP7's Live Room | G is a superb physical modeling speaker cabinet emulator plug-in with four mic channels (two mono and one stereo), mixable mic positions (close, near and far) and 3-band EQ per channel. What convolution did for reverb, Live Room | G does for speaker cabinet emulation, thanks to the next-generation physical modeling technology at its core. Engineered for the unprecedented power of today's personal computers, the modeling technology in Live Room | G captures every nuance and detail of the hundreds of factors that interact to recreate the rich, detailed sound of a speaker cabinet in a real room recorded by four separate mics. Five cabinet models are supplied, including a 4x12 Modern for ultra-distorted chunks and sludge, a 4x12 Vintage for those '80's hair-band tributes and '70's proto-metal, and a 2x12 Combo for Muscle-Shoals-style southern rock and country. First and foremost, Live Room | G is an indispensable component (usually the final stage) for DP7 guitar tone signal chains. Users can combine Digital Performer's stomp pedal effects, Custom '59 amp emulator and Live Room | G's cab emulation in virtually unlimited combinations to create unprecedented realism for guitar parts, bass parts, and any amped instrument. Live Room | G opens a world of possibilities for hearing any track through a speaker cabinet. What might take hours of setup and tinkering with a real cabinet in a room with multiple mics will take just a few moments to set up on screen in a Digital Performer project. Users can experiment with just about any sound source to add depth, dimension and organic feel. Channel Strip — a customizable, floating window (or edit window cell) that provides instant access to each track's mixer channel. Channel strip always follows the track the user is working on. Inline EQ and dynamics — lets users control EQ and dynamics directly in each Mixing Board channel with a multi-band graphic EQ display and a vintage-style compression meter, using any included EQ or dynamics processor, such as Digital Performer's award-winning modeled British console EQ and leveling amplifier faithfully modeled after the legendary LA-2A. Consolidated V-Racks — lets users view V-Rack virtual instruments and effects side by side with disk tracks in the Mixing Board. Info Bar mixer controls — provide instant access to mixer channel settings in any edit window and follow the track being worked on. Large Counter — users can freely resize the Counter window to any size, even the entire width of their computer screen. Marker Counter— displays markers in large type directly in the Control Panel and/or resizable Counter window. Users can instantly jump to any marker, and even use markers as a teleprompter for lyrics during live performance or recording sessions. Lyrics — users can type in lyrics directly below notes on the QuickScribe page, or paste them into the lyric window from their word processor and flow them into a track with one click. Lyrics can be shared among several parts. Transposable chord symbols — users can add complex chord symbols directly on the page and transpose them at any time, together with or independently from notes. Along with lyrics, users now have everything they need to quicky create and print standard lead sheets. QuickScribe notation enhancements — numerous enhancements help speed notation workflow and give users even more control over the look of their score. 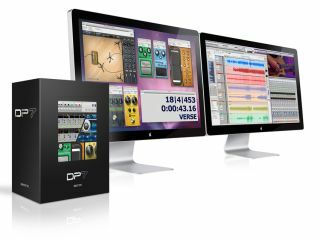 Support for Pro Tools 8 — DP7 delivers industry-leading support for operation as a complete software front-end for Pro Tools | HD systems. Next-generation sample rate conversion — a new ultra-fast, CPU-efficient sample rate conversion algorithm delivers increased precision, efficiency, and transparency, with a 138 dB signal-to-noise ratio. Wave64 support — support for the industry standard Wave64 extension to the Broadcast WAVE file format lets users record and import audio files larger than 4GB. Range automation modes — users can raise, lower or write automation moves within any selected range, preserving everything before and after. Audio Unit instrument side chains — users can route side chain inputs to any third-party Audio Unit plug-ins that support side chains. Users of competing products can purchase the DP7 Competitive Upgrade at the link above or from any authorized MOTU reseller.